Please describe the grand design and road map on PTFI’s Good Mining Practices? 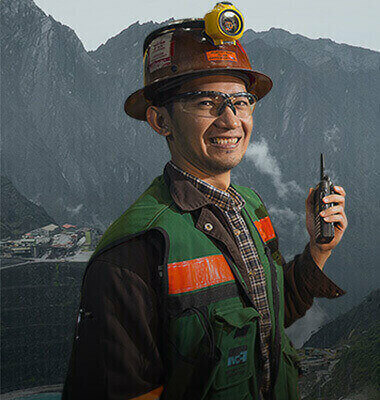 PTFI carries out Good Mining Practices in its mining operations, adopting the seven aspects of good mining practices, of applying the appropriate mining technology, concern for the environment, concern for workplace safety and health, application of conservation principles, adding value to regional development and the local community, optimizing metals and minerals utilization for society, and mining standardization. What is your view on environmental degradation arising from PTFI mining operations in Papua? Many say your tailings are destroying the surrounding land. We recognize there are risks arising from mining operations, including environmental pollution from tailings. We have made this issue a priority and we are therefore guided by Good Corporate Governance as prescribed by ICMM, EITI, GRI. EITI – espousing the Extractive Industries Transparency Initiative by disclosure of all incomes and payments. Such practices minimize impacts on the environment from our operations. We also have a comprehensive rehabilitation program for areas where tailings have stabilized. We restore and rehabilitate soil to provide productive land for agricultural purposes where local residents may carry out animal husbandry and farming activities to grow various crops (pineapple, sago, sugar cane, banana, and yam). What do you mean by “minimizing” impacts of mining operations on the environment? Tailings management is performed in accordance with AMDAL approved by the government of Indonesia, after numerous technical studies were conducted. Tailings management is also evaluated through independent audits conducted by internationally reputable experts. These experts hace carried out a comprehensive evaluation of our methods of managing tailings. We have comprehensive rehabilitation programs for areas where tailings have stabilized. We restore and rehabilitate soil to provide productive land for agricultural purposes where local residents may carry out animal husbandry and farming activities to grow various crops (pineapple, sago, sugar cane, banana, and yam). We document the biodiversity found in Papua, and published books on this biodiversity which we have distributed free of charge to those who would benefit the most from such books. Other instances are our collaborations with UNIPA, LIPI, to undertake research on biodiversity. UNIPA: research on fish and crabs breeding in tailings locations; research on biodiversity, including on the endemic pig-nosed turtle, which is thriving in tailings locations. LIPI: research on illegal mining and its consequence on the environment. PTFI recognizes and addresses impacts on the environment. We are working together with the government and experts to minimize inevitable impacts from mining operations. Is it true that PTFI tailings have been classified as hazardous? Three independent laboratories (Inch Cape Testing Services – USA, Cresent Technology Inc – USA, Corelab – Indonesia) have indicated that PTFI tailings pass TCLP and LD50 tests for hazardous wastes in accordance with the regulation PP18/1999 jo PP 85/1999. These test results are available and have been presented in many meetings with the Ministry of Environment (MOE). Is it true that PTFI minerals contain uranium? This is categorically untrue. The Republic of Indonesia Nuclear Energy Supervisory Board (Bapeten) has publicly stated that no significant amount of uranium was found in the PTFI operations area. Does PTFI use mercury in its mining process? No, PTFI uses no mercury at all in its mining process. We do not use mercury because of the risk to humans and the environment. We use the method of processing ore into concentrate. The residue from processing ore into concentrate is what we call tailings, which is a non-toxic mine waste. Please describe what you have undertaken and will undertake in controlling environmental pollution and or degradation, including prevention, mitigation, and environmental restoration. And what sum of funds have you earmarked for this purpose. Material impacts from PTFI operations are overburden, tailings and social ills. As such, the primary focus of PTFI’s environmental management is on these three issues. Management of overburden is centered on how to render stockpile slopes geotechnically stable on their site. Generation of acid rock drainage ARD) is prevented by combining in appropriate proportions, overburden containing limestone with potentially ARD-generating overburden. ARD generated is collected and neutralized with lime. The neutralized drainage is recycled and reused for the ore mill. To minimize impacts, tailings is transported to the lowlands and deposited between two levees. As soon as it is practicable, the tailings deposition area will be revegetated. The 600-hectare Double Levee area has been revegetated by means of reclamation as well as through natural succession, demonstrating that the functions of the tailings deposition area can be restored within a period not too long (<15 years). PTFI has social programs in the areas of health, education, facilities and infrastructure, economy, culture and others. The programs are designed such that by the end of the mine’s lifetime it is hoped the people of Mimika will have become self-sufficient and no longer reliant on mining. Every year PTFI sets aside funds for environmental management and monitoring. In 2009, the actual sum spent on environmental management and monitoring activities came to US$57.3 million, and in 2010, US$63.3 million was allocated. Is it true the PTFI tailings stream has now entered the coastal area? The riverine transportation and deposition of tailings follows international best practices and was approved by the government of Indonesia after many technical studies and reviews were performed. The tailings management system entails the use of rivers with fast currents (Aghawagon and Otomona) beginning near the ore mill in a deep valley at an elevation of approximately 2,800 meters, to transport rocky material out of the highlands to the tailings deposition area approved by the government of Indonesia, which includes PTFI’s lowland project area, the estuary, and the Arafura coast. How does PTFI plan to contribute to MP3EI, specifically in Corridor 6 (Maluku, Papua and West Papua)? 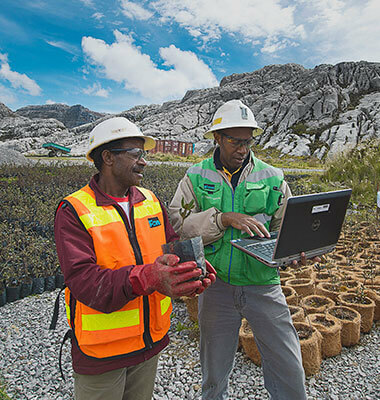 Among others, our contribution to MP3EI will be through expansion of PTFI mining in Papua. This project will absorb 27.5% of the total groundbreaking value under the 2013 Master Plan for Acceleration and Expansion of Indonesia’s Economic Development (MP3EI) of Rp545 trillion. This Rp.150 trillion projects is also said to be the biggest groundbreaking this year. 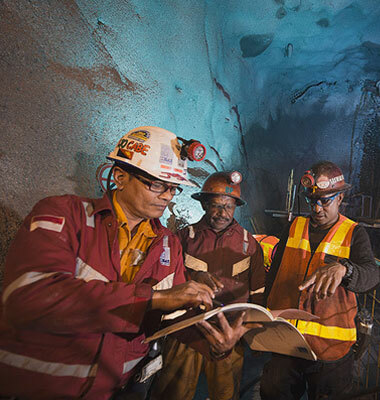 Also, PTFI has proposed an underground mining megaproject that will be one of Papua Province’s prime long-term projects until 2041, for an investment of US$18.5 billions or equivalent to 10% of MP3EI total project investments. Additionally, PTFI is currently supporting the Papua Province government in several regional development programs, including a cement packing plant and the Urumuka hydropower plant, both of which will be located in Mimika Regency. What are PTFI’s community development goals? Have the community development activities carried out to date achieved the desired goals? All understanding of our community development programs must be preceded by an understanding of Papua’s history. When PTFI first began operating in 1967, Papuans had very little infrastructure, and schools and health facilities were very few in number. At the time, the literacy level among the people was very low, they were highly susceptible to diseases such as malaria, and they lived in poverty. The remote location and rugged terrain exacerbated the situation. Our community development programs are focused on helping the local community to build sustainable economic programs, raising the literacy level, providing vocational training, and providing effective healthcare programs. This is the commitment we have carried out, not just morally but also financially. What concrete examples of programs may be obtained from the community near the PTFI project area? According to a study conducted by LPEM-UI in 2012, PTFI contributes 95% of Mimika’s regional gross domestic product, and 45% of that of Papua Province. To 2012, PTFI total investment in infrastructure such as roads, ports, airport, electricity, and so on came to 8.5 million US dollars. Also, from 1996 to 2012, PTFI’s Partnership Fund for local community development totaled 550 million US dollars. In addition to the Partnership Fund Program, PTFI has an Operating Funds program that includes health programs (implemented through Public Health & Malaria Control/PHMC), accompaniment for small and medium businesses, village-based community development, and support for village infrastructure development. The Operating Fund Program also includes a Trust Fund for two tribes holding customary land ownership of PTFI’s operations area, the Amungme and Kamoro, amounting to 500 thousand US dollars per year, and distributed through the Yayasan Waartsing foundation for the Amungme tribe, and the Yayasan Yuamako foundation for the Kamoro tribe. To 2012, the total sum paid out by PTFI for the Trust Fund came to approximately 50 million US dollars for the two tribes who are the customary landowners. It should be noted that of the approximately 30,000 workers at PTFI, 30% are Papuans. They occupy various levels and positions in PTFI according to their respective competencies, ranging from junior positions to senior posts such as Vice President (VP) and Commisioner. PTFI is committed to supporting sustainable economic development for local communities in Mimika Regency. To this end, PTFI engages in partnerships with the local administration, the Amungme and Kamoro Community Development Organization (“LPMAK”), churches and the Diocese, USAID, and others. PTFI supports regional economic development through aid provided for infrastructure development, development of Micro, Small and Medium Businesses (“UMKM”), and development in the agricultural, fisheries, and animal husbandry sectors. PTFI also funds health and education programs for local communities through programs carried out by LPMAK. Increasing awareness and participation of parents and stakeholders to develop education. In 2011, PTFI priority was on increasing cooperation and coordination with the Mimika Regency administration to support development of quality of life among Mimika regency residents, specifically in the areas of Health, Education, and Economy. Community development programs carried out by LPMAK in 2012 were funded through the Partnership Fund, sourced from the company’s gross revenue to the amount of approximately 39.4 million US dollars. All activities and expenditures have been audited and will continue to be audited in a transparent manner. An audit performed in 2010 found all partnership fund expenditures to be valid and reasonable.